This Symbala was inspired by a logo representing the spirit and intentions of the ubuntu movement begun by Michael Tellinger. The 3/6 geometry base reflects creativity coming from the heart and fused in family, as in the family of man. The tree/roots symbol embodies the grassroots community effort to bring about world-shifting changes. Time for Vision and Change! Welcome to ubuntu, a way to change the world one community at a time. Michael has become a real-life Indiana Jones, making ground-breaking discoveries about advanced vanished civilizations at the southern tip of Africa. His continued efforts and analytical scientific approach have produced stunning new evidence that will force us to rethink our origins and rewrite our history books. In addition to being a proponent of alternative archeology and alternative theory of human origins, Tellinger is also a proponent of contributionism, a social movement based on the African philosophy of ubuntu (a world without money). Contributionism postulates moving from a money-driven society to a society driven by people, their talents and their passion for life. Where everyone contributes their natural talents or acquired skills to the greatest benefit of all in their community. New World Vision inspires from many Symbala products (card, poster, magnet and medallion, etc.) in my Zazzle Store. Featured Symbala of the Month, August 2017. Riding in on the softness of summer came a Symbala to support and embrace this feeling of nurturing ourselves. I love the geometry of the star tetrahedron and use it often because it reflects the union of the magnetic and electric energies which uplift us with a reminder of our wholeness. 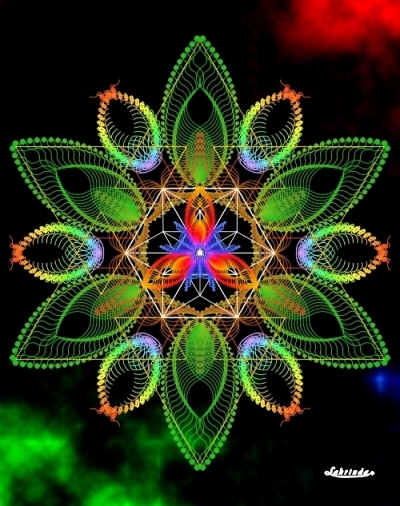 Complementing this theme is the full spectrum support of the chakra frequencies. From head to toe, from inner and outer and all layers of our being we are remembering to love ourselves and lavish that love with kind nurturance. Here is a tool to aid this process with a soft, loving focus. P.S. Don’t forget to browse through my Zazzle Store for spiritually nourishing products, too. Enjoy! The word ‘networking’ came to me right after I completed this Symbala and especially after I printed it and held it in my hands. These days it’s a popular word used in many different arenas. Getting down to the essence of the word reveals two important factors: a cohesive linking for the purpose of some type of sharing or manifestation. The starry net appearing in this Symbala comes from a base of ‘6’ geometry with the star tetrahedron. 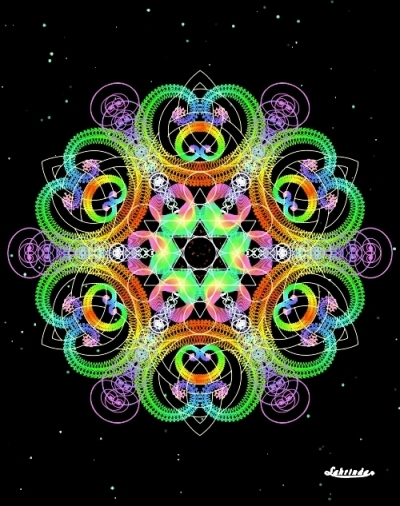 This network is rooted in love with the symmetrical joining of the feminine/magnetic downward pointing triangle with the masculine/electric upward pointing triangle. The net formed by this joining streams out to produce starry children and on and on. 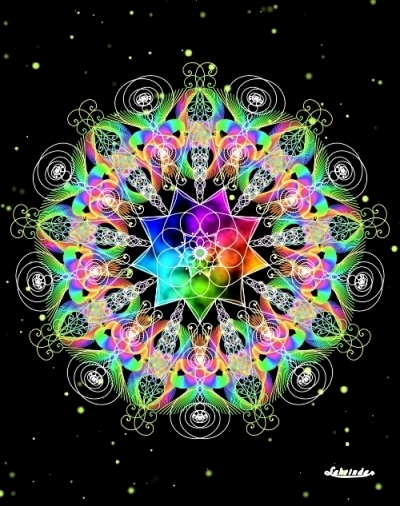 . . For me, when you combine the elements of co-creation, common purpose and loving connection, you have a network of high vibration capable of surprising manifestations. May you feel the love and purposeful cohesion of ‘Networking’. The light of ‘Networking’ shines from many Symbala products (card, poster, magnet and medallion, etc.) in my Zazzle Store. Featured Symbala of the Month, July 2017. Early on I discovered the power of naming something I create. It takes on a life of its own, both to empower or to bedevil. I smile and feel uplifted for naming myself when I found ny direction in life. It was like claiming the vision of my life – so I made it legal to be Lahrinda Eileen! Each time I get a message for co-creation with the naming when I draw a new universal Symbala, I feel excitement! I love sharing the Symbalas with you and it expands my world when you’re part of that wonderful process. Many of you caught an energy of playful expansion from this Symbala. I felt it strongly when I was drawing it and the synchronicity of announcing the name on the day of the New Moon in Gemini was metaphorically delicious! 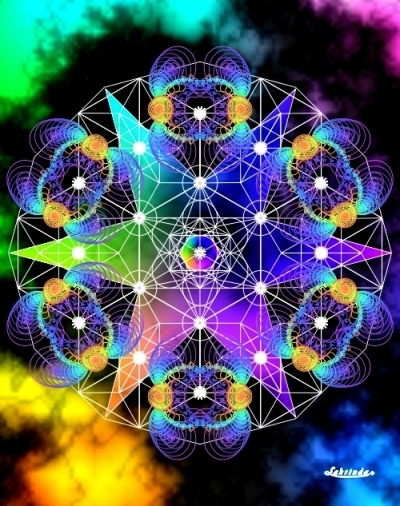 The use of ‘8’ geometry brings the energy of manifestation, being a higher dimensional expansion of the ‘4’ of form. In addition the moon’s need for variety and expressions of curiosity all blended to resonate with the name suggested by Jennifer Ward, who offered – ‘Oh, the Possibilities!’. Many thanks, Jennifer! And my thanks to all of you who joined in this co-creative process with enthusiasm and whimsy! Well done! P.S. Also, don’t forget to browse through my Zazzle Store for the ‘Possibilities’ on many products, too. Enjoy!